Pierce Egan was probably born in London in 1772. He was employed in the print trade as a compositor. 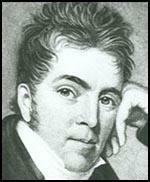 In 1812 he became a journalist working for The Weekly Dispatch . Later that year he published the first volume of Boxiana. This was followed by The Mistress of Royalty (1814). He also published a number of light-hearted city guide books on Liverpool, Dublin and Bath. A colleague described him as "a right-minded fellow, and was respected by all who knew him". 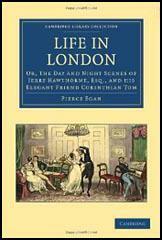 In 1821 Egan joined forces with George Cruikshank to publish Life in London. According to his biographer, Dennis Brailsford: "Egan's greatest success came in 1821, when his two characters Tom and Jerry first appeared, in Life in London, or, The day and night scenes of Jerry Hawthorn, esq., and his elegant friend, Corinthian Tom, accompanied by Bob Logic, the Oxonian, in their rambles and sprees through the metropolis. Its popularity was instant and unprecedented, and the demand for copies increased with every month. Its attractions lay in both content and style, for its contrasting characters and scenes, setting the misery of low life against the prodigal waste and folly of high society, were all presented with vivacious dialogue and lively description and accompanied by the excellent illustrations of the brothers George and Robert Cruikshank." Robert L. Patten, the author of Charles Dickens and his Publishers (1978), explained the success that Egan had with this venture: "In 1820 Pierce Egan hit on a scheme for issuing coloured plates, etched by the Cruikshank brothers, along with letterpress leading up to the big scene, once a month until the story... was completed in twelve monthly numbers (Whether the lively plates, the flash letterpress, or the mode of publication was responsible is difficult to determine, but the combination proved irresistible, and Tom and Jerry's adventures were widely purchased, imitated, dramatized, plagiarized, and extended in sequels." Peter Ackroyd has said of Life in London: "Egan has the characteristic eighteenth-century belief in rationalism and generalisation, together with a certain eighteenth-century syntactical politesse most obvious in his sometimes arch circumlocutions. Despite the apparent raciness of the theme, the material is always somehow set at a distance from the reader, a characteristic nowhere more in evidence than in the fact that Egan always prints colloquialisms in italics as if they were part of some alien language." Egan was mainly a sports reporter and was especially interested in boxing. 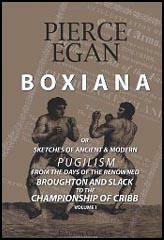 In 1823 he established his own sporting journal, Pierce Egan's Life in London and Sporting Guide . This was later merged with Bell's Life in London . His biographer has argued: "His descriptions of fights were full of graphic action and high drama, more bloody, it was said, than the fights themselves. He was always prepared to embellish the truth in the interests of entertainment, especially where one of the subjects was Irish and so merited particular praise... Egan plunged into the language of the street and the tavern, embellishing it unashamedly and giving it an immediacy and vitality, which, however spurious, brought to his avid readers a sense of connection with life's great excitements." Egan also reported on criminal cases and in 1824 published An Account of the Trial of John Thurtell and Joseph Hunt for the murder of William Weare . Egan's writing created a great deal of interest in the case and when the murderers were hanged at Hertford they attracted a crowd of 15,000. Egan also published the novel The Life of an Actor (1824). Other books by Egan include Sporting Anecdotes (1825), Finish to the Adventures of Tom, Jerry, and Logic (1828), The Show Folks (1831), Pierce Egan's Book of Sports and Mirror of Life: Embracing the Turf, the Chase, the Ring, and the Stage (1832) and The Pilgrims of the Thames (1838). Pierce Egan died at his home at 9 Regents Terrace, Islington, on 3rd August 1849. In 1820 Pierce Egan hit on a scheme for issuing coloured plates, etched by the Cruikshank brothers, along with letterpress leading up to the big scene, once a month until the story... was completed in twelve monthly numbers (Whether the lively plates, the flash letterpress, or the mode of publication was responsible is difficult to determine, but the combination proved irresistible, and Tom and Jerry's adventures were widely purchased, imitated, dramatized, plagiarized, and extended in sequels. The whole idea of Pickwick's adventures might have come from Pierce Egan. In fact the novel does begin in the manner of Egan, but then Dickens's own vision gets the better of him as he proceeds... But the differences become obvious almost from the start: if we look at Pierce Egan's series on Tom and Jerry, whose adventures were always said most to resemble those of Mr Pickwick, there is an absolute contrast between them. Egan has the characteristic eighteenth-century belief in rationalism and generalisation, together with a certain eighteenth-century syntactical politesse most obvious in his sometimes arch circumlocutions. Despite the apparent raciness of the theme, the material is always somehow set at a distance from the reader, a characteristic nowhere more in evidence than in the fact that Egan always prints colloquialisms in italics as if they were part of some alien language.